Trappers End020 8942 0342work020 8942 0344fax Self-cateringComfortable, detached family home, sleeps 6 in three bedrooms. Fresh linen, heating and hot water included. Off street parking for two cars. Sunny patio and enclosed garden. 1.5km from beach and town centre. Cot, high chair and extra folding bed. Free WiFi available. 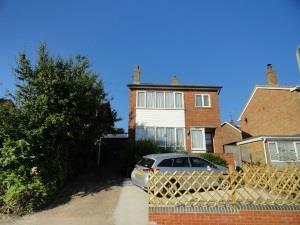 Comfortable, detached family home, sleeps 6 in three bedrooms. Fresh linen, heating and hot water included. Off street parking for two cars. Sunny patio and enclosed garden. 1.5km from beach and town centre. Cot, high chair and extra folding bed. Free WiFi available. Three bedrooms, secure bike park, short break rates, cooking with gas/electric. Enclosed garden with patio and furniture. Children welcome from any age. Trappers End offers weekly bookings starting on any day and short breaks of 3 or more days starting on any day. House with lounge, dining room and 3 bedrooms.